When I make pictures I try to find the one interesting item in a scene that makes a picture different. 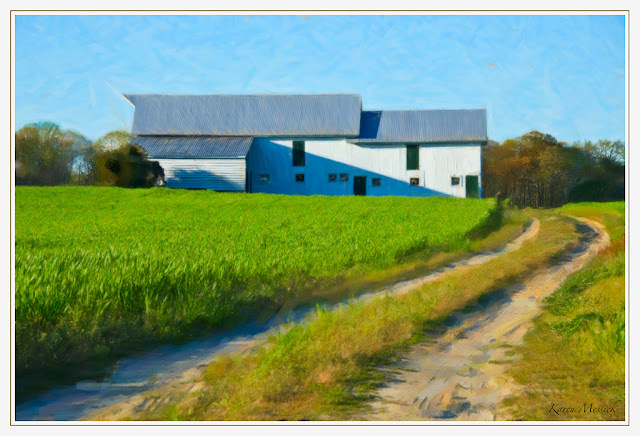 The image above was taken in Talbot County, Maryland a county that resides in the DelMarVa region. 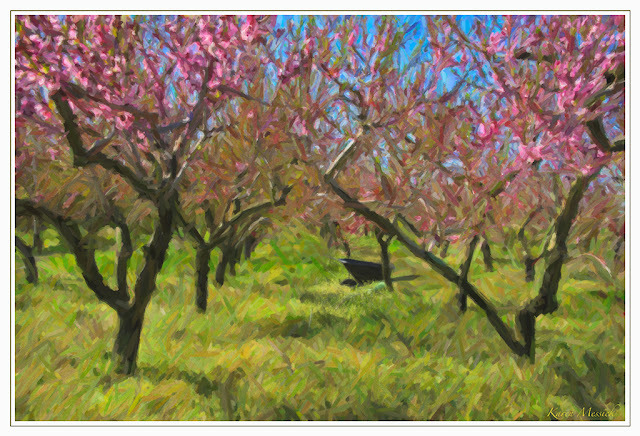 As I drove by the grove of trees, the abandoned wheelbarrow, pink blooms and spring grass caught my eye...so I made a u-turn and made a few shots....for me the image without the wheelbarrow would be less interesting. I also loved the shapes of triangles created by the branches as well as the strong leading line back into the orchard. These are compositional elements I look for, when making images. 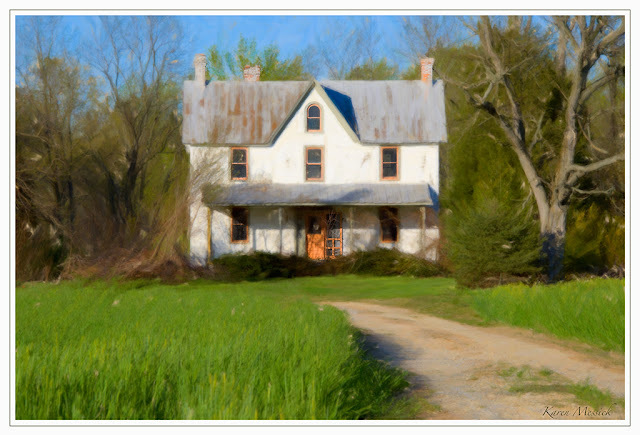 There are many old farm houses on the DelMarVa...most are not accessible due to private lands, but this one was visible from the road, long abandoned and quiet in the late afternoon light. The one main element that really made this image work for me was the open screen door. Something about those old wooden screen doors I really enjoy. The strong diagonal shadow across the front of this barn stopped me again, and I was lucky that I could shoot this from the road. 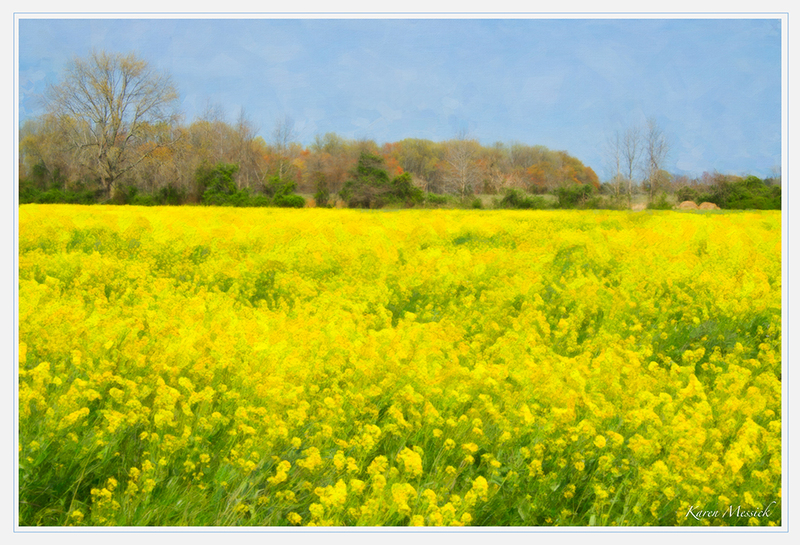 This week has been filled with bright blue skies, spring green fields and budding trees. The leading line of the two track added a really nice compositional element for me to work with. Fields and fields of bloom begged to be photographed. So once again from the road I was able to make this shot. Compositional colors play out here with the contrast of blue and yellow. I was careful to balance the yellow in the lower two thirds of the frame, while positioning the large tree in the upper left of the frame. I will be presenting on April 11 from 6:45-8:45 "The Art of Seeing" in Tysons Corner, Virgina, where I will expand on compositional ideas I use while making images. For those readers who may not know about the DelMarVa...here is the official info from Wikipedia...it's a pretty unique area. The Delmarva Peninsula is a large peninsula on the East Coast of the United States, occupied by most of Delaware and portions of Maryland and Virginia. The peninsula is 170 miles (274 km) long. In width, it ranges from 70 miles (113 km) to 12 miles (19 km) at the isthmus on its northern edge to less near its southern tip. It is bordered by the Chesapeake Bay on the west, the Delaware River, Delaware Bay, and Atlantic Ocean on the east, and the Elk River and its isthmus on the north. The northern isthmus of the peninsula is transected by the sea-level Chesapeake and Delaware Canal. Several bridges cross the canal, and the Chesapeake Bay Bridge and the Chesapeake Bay Bridge-Tunnel join the peninsula to mainland Maryland and Virginia, respectively. Another point of access is Lewes, Delaware, reachable by ferry from Cape May, New Jersey. Dover, Delaware's capital city, is the peninsula's largest city by population but the main commercial area is Salisbury, Maryland, near its center. Including all offshore islands (the largest of which is Kent Island in Maryland), the total land area south of the Chesapeake and Delaware Canal is 5,454 sq mi (. The entire Delmarva Peninsula falls with the coastal plain, a flat and sandy area with very few or no hills. The fall line, found in the region southwest of Wilmington, Delaware and just north of the northern edge of the Delmarva Peninsula, is a geographic borderland where the Piedmont region transitions into the coastal plain. Love these especially the abandoned house (which I would have gone inside as well). Sounds like a beautiful place to shoot and will add to my list of places to visit.